Museum of Contemporary Art including the Young Artists Gallery, MOCA Annexe and MOCA Cafe. A private museum dedicated to contemporary art exhibtions, events and acquisitions. Young Artists Gallery, 23 Manning Street, South Brisbane- entrance was through MOCA Cafe. 164 Melbourne Street, South Brisbane. MOCA was one of the only major Queensland institutions during the years 1987-1994 to actively support artist-runs in both its exhibition and acquisitions policies. 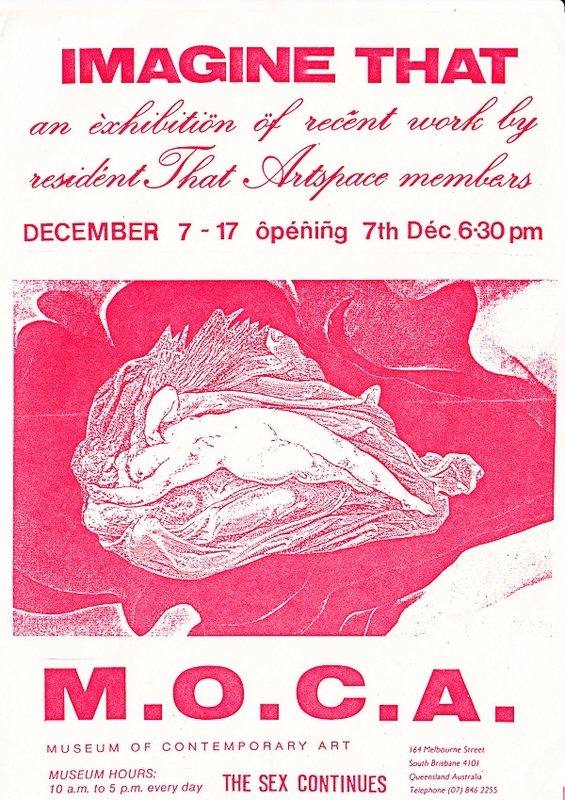 Artist-run motivated exhibitions including Imagine That (1987), and Ice, Fire and the Empire (6-30 November 1987). Director james Baker opened the Young Artists Gallery to assist with increased exhibition and professional development opportunities for emerging artists in (circa) 1988.